We kicked off Bike to School Month in style this morning with a fantastic family-focused bike event at our elementary school. Judging from the turnout – easily more than 100 people – it seems there’s no better way to get families excited about biking to school than getting them biking at school. Of course a rare sunny (this spring in Seattle, anyway) Saturday didn’t hurt numbers. 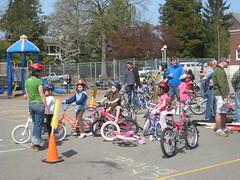 The young pedalers participated in a bike rodeo sheparded by an enthusiastic team from Cascade Bike Club, got bikes tuned by a some wrench-savy dads, ate some tasty snacks from PCC while their parents drank coffee courtesy of Starbucks. 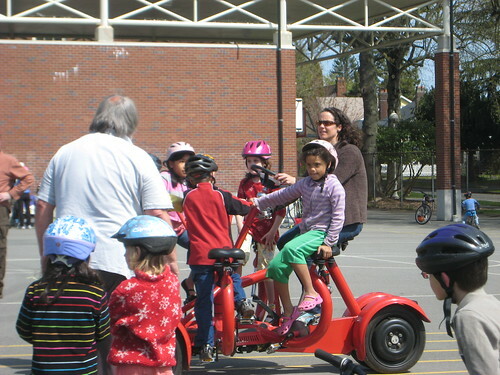 As you can probably imagine, the big hit was Dutch Bike Seattle’s conference bike that Anne piloted (nearly non-stop for two hours) around the schoolyard. Stephan and David of the Dutch Bike Co. Seattle fame graciously donated a couple of hours of Conference Bike time. Thanks guys. The kids loved it. We heard several parents being urged by their kids to hop on and ride with them. Many did and had a great time. Some stood on the sideline. We even heard a few tell their kids they couldn’t ride because it’s “just for kids”. Nice excuse folks but the conference bike is really for adults – the kids can barely reach the pedals and Anne could have used some help in the power department (especially in the second hour); next time hop on and help pedal. Event co-organizers Leslie and Clint did a super job getting particpants and sponsors on board. We aren’t sure if they had any pull with the weather but they certainly did a number on the mechanics, coffee, snacks, and those Cascade ambassadors who cheerfully taught kids the rules of the road while having them dodge chalk “boulders,” “cars” and other obstacles. Though we have a whole month of biking to school ahead of us, we can’t help but look ahead to next year’s kick off event. We’re already talking about adding a neighborhood kid-focused bike swap and a beer garden. OK, Tim made up the beer garden part but we think the bike swap would be a hit! So, who’s riding to school this month? This entry was posted in alternative transportation, bikes, kids, neighborhoods, seattle and tagged Bike to School Month, bikes, conference bike, cycling, Families, Family Cycling, kids. Bookmark the permalink. We say Tim and Anne have CoBi carte blanche. Cheers to Leslie and Clint too. Thanks for the wine, chocolates and gas money for our stinky van.